Select the design templates to which the respective user or user groups should have access. After you finished your selection or deselection, do not forget to hit the '''Save''' button: [[File:Save.png|0.75px]]. 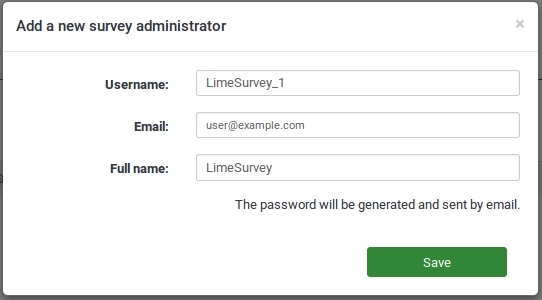 Superadministrator: This permissions can only be added or removed by the user called admin and grants full permission to the whole LimeSurvey application. With template permissions, you can decide which design templates a user can select when creating or editing a survey. It might be a good idea to restrict the design templates a user can select in order to prevent unwanted use of design templates, which you might consider to not be suitable for a survey/questionnaire. For example, if you have a specific design template for a group of users or customers, you might want to restrict their access to other templates to only make them use the template created for their purpose. Select the design templates to which the respective user or user groups should have access. After you finished your selection or deselection, do not forget to hit the Save button: .